On Friday morning, I heard a roaring sound around 3:45. It sounded like a plane was flying really, really low. It stirred me, but I fell back asleep. At 4:19, I heard a lot of sirens. We hear a lot of sirens in our house, because we have 3 arterials within a few blocks of our home, so I didn’t think much of it, except that there were so many. At 4:35 I heard a lot more, and was awake enough then to realize the sirens were coming to rest somewhere nearby. They usually fade off in the distance, but it was a clear “stop” near our house. I slept fitfully through helicopters and other noise until about 6:00 when Scott got up. Scott came running back into the bedroom and told me to turn on the news. 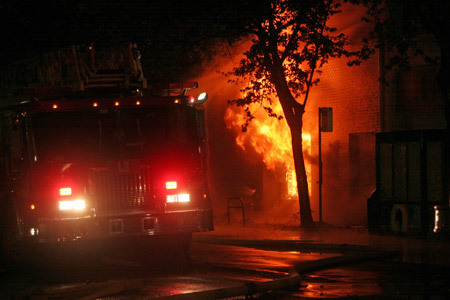 It turns out there was a massive fire burning a whole block of our “downtown” business district in the neighborhood. There were over 100 fire fighters there, trying to prevent the fire from spreading and evacuating the people who lived in apartments over an adjacent building. Seattle’s neighborhoods are sort of like small towns, a few restaurants, a theater, pet store, toy stores, boutiques, coffee shops, pubs, pharmacy, and grocery stores. We make it a point to walk to all of these businesses regularly, supporting the neighborhood where we can. Well, we lost three restaurants and a coffee shop that was a non-profit store, serving the community as a gathering place. The shop was founded by a pastor who holds his church services in the adjacent theater on Sunday mornings. 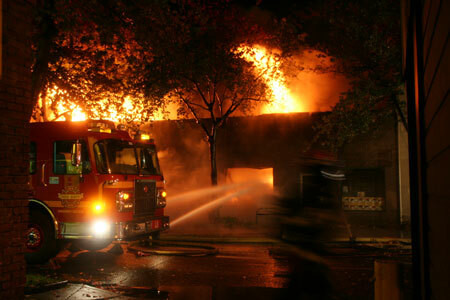 The theater was badly damaged by water and smoke. The production has moved to Seattle Children’s Theater by the Space Needle for tonight, but there is no word on if their next production will start as scheduled during Thanksgiving weekend. If they do, I know two people who will be there! They still don’t know what caused the fire as the building is so unstable, the inspector cannot go in. Everyone in the neighborhood is trying to figure out how they can help, and it’s neat to see the community rally for these family owned businesses. I hope everyone keeps sight of what we love about our own little town within a city and helps get these businesses back on their feet. Fortunately, the theater owns the whole building and has appropriate insurance. I borrowed some photos from our neighborhood blog and posted them for you below. You can see in this one that the brick facade is still up, but if you go behind the building there is nothing left. The roof collapsed shortly after the firefighters got there (thankfully, the man in charge read the fire correctly and pulled all fire fighters out minutes before the collapse). 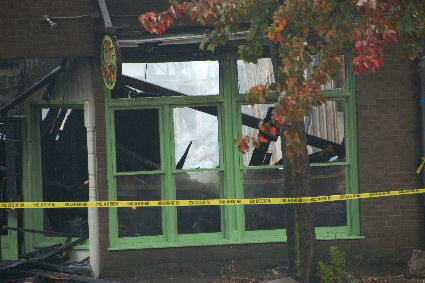 A few prayers for the families and business owners to be able to get back on their feet would be appreciated! Summer has officially ended! The leaves are starting to turn and the rains have come. I think we are making up for hot and dry summer. I remember when I lived on Lake Washington and we would have stinted summer…I lived in a great community of a cluster of cottage-like apartments right on the lake, with a huge dock! In the summer, we would all leave our noodles, floats (I had a giant blow up Orca…yeah), and other summer gear out on our front lawns for the taking. If I had a party, I borrowed my neighbor’s floats and noodles and so on. We had midnight full moon swims during the two hot months of the year. It was such a great community! One summer we just never had a summer. It was kind of weird. The 4th of July passed, we had an excellent Blue Angels weekend and then it just stopped. All of our floats just sat there deflating…waiting to be used. It was sort of depressing when it was in the low 50s on Labor Day Weekend and we all sat on our lawns closing up for summer without really having one. They had an EPIC swimming summer this year. I miss that place, and beg Scott to have a “summer cottage” there…he has not bought into that scenario. Yet. This great summer has come to a close. I pulled up all of the veggies (save one plant) and planted the cover crop. Scott trimmed the trees and prepared for a blustery long winter. In all, we harvested about 100 Serrano peppers, 15-20 pounds of tomatoes (many green ones as you see below), 20 pounds of potatoes, a few carrots, and a lot of Butter Lettuce. It was a great gardening year. I said there was one plant I didn’t pull. It was the Habanero plant. Such spicy peppers don’t really grow up here in the northwest without a lot of intervention. I planted this one against the house where it would get maximum sunlight and heat. It flowered profusely throughout the summer, but never gave me fruit. Well… three days before our first freeze, I noticed fruit!!!!!!!! I didn’t have the heart to pull it, I’m letting it go. We’ll see if we can get one more bit of spice from the garden. Yum! I sowed seeds for fava beans, which serve as an excellent cover crop. After the long growing season, they bring some much needed nitrogen to the soil, in preparation for 2010 gardening. It’s kind of nice to see the calm dirt. (note: within 3 days of pulling all of the weeds and plants, there were MORE WEEDS sprouting).